Abstract interpretation provides a practical approach to verifying properties of infinite-state systems. We apply the framework of abstract interpretation to derive an abstract semantic function for the modal μ-calculus, which is the basis for abstract model checking. The abstract semantic function is constructed directly from the standard concrete semantics together with a Galois connection between the concrete state-space and an abstract domain. There is no need for mixed or modal transition systems to abstract arbitrary temporal properties, as in previous work in the area of abstract model checking. Using the modal μ-calculus to implement CTL, the abstract semantics gives an over-approximation of the set of states in which an arbitrary CTL formula holds. 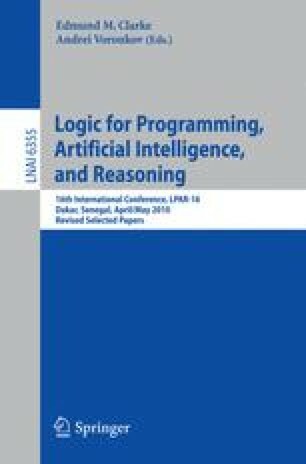 Then we show that this leads directly to an effective implementation of an abstract model checking algorithm for CTL using abstract domains based on linear constraints. The implementation of the abstract semantic function makes use of an SMT solver. We describe an implemented system for proving properties of linear hybrid automata and give some experimental results. Work partly supported by the Danish Natural Science Research Council project SAFT: Static Analysis Using Finite Tree Automata.